With private medical insurance you will guarantee excellent health protection. The private sector offers luxury coverage, demonstrated by its vast experience in the medical plans market in the United States. That’s why we invite you to visit us at your preferred agency. Dulcinea Insurance takes care of each transparent step in its application process. 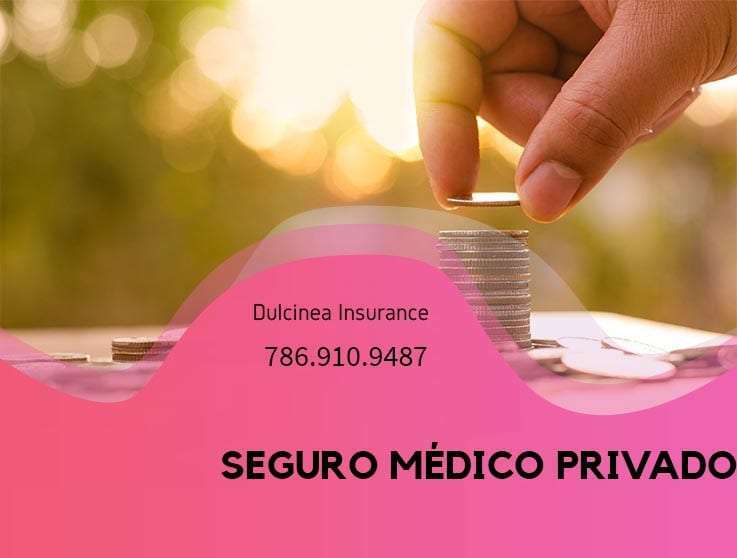 Contact us through telephone 786.910.9487 so you can find out about the characteristics of private health insurance. 1 How do private health plans work? 2 How much do private health plans cost? 3 What coverage does private health insurance provide? 4 When is the enrollment period for private health plans? 5 What documents must I submit to apply for private health insurance? How do private health plans work? Private medical insurance is granted to any patient who needs it and has money to pay for their protection. The first step is to register in our offices. Then, your case will be taken by a specialized insurance company. How much do private health plans cost? If any element can be highlighted as negative within private insurance, it is the price that they present. The rates are far from those shown by the Obamacare medical insurance. The fees to pay, range between 300 and 1000 dollars for each month of protection. Of course, there are other more luxurious plans that surpass the last mentioned figure. If we make a quick comparison with Obamacare insurance we will find notable differences. Recall, first, the most affordable insurance prices in the country. In this case the highest fee is $ 60. The minimum does not pass above $30. Of course, there are differences in other aspects of the coverage that both present. What coverage does private health insurance provide? If we talk about coverage, you should know that the one offered by private insurance is very broad. Here you can find protection for children in dissimilar medical specialties. Likewise, the private plan includes emergency care and hospital care of various kinds. Perhaps, you think that private insurance falls below other coverages in terms of quality. Nothing more wrong because this health plan has many facilities for those who decide to enroll in it. When is the enrollment period for private health plans? This is another advantage. To apply for private health insurance you should not wait for any special period. You are free to visit us during any month of the year to begin your registration process. This benefit attracts thousands of patients each year. It is clear; it is very convenient to hire this insurance when you really need it. What documents must I submit to apply for private health insurance? If we talk about advantages, now it is essential that you know that no special document is required to apply. You only need to bring us your identity document and the latest receipts of your annual income statements. You see, everything is easy if it is to specify an effective management through the advice of Dulcinea Insurance. Do not miss this opportunity to hire private medical insurance. Contact us through telephone 786.910.9487 now!